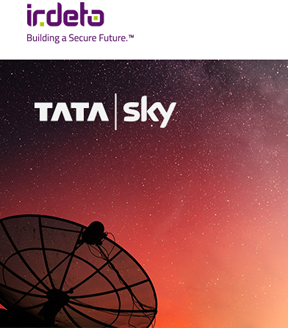 Irdeto has expanded their long-term security partnership with Tata Sky, India's leading content distribution platform providing satellite payTV services. The highly competitive satellite payTV market in India requires operators like Tata Sky to continue innovating in order to meet consumer demand for premium solutions and services. With Irdeto, Tata Sky has a reliable and trustworthy security partner to ensure the secure delivery of content onto any device across its satellite and OTT platforms in India. Tata Sky will implement Irdeto Cloaked CA and Middleware to deliver an improved customer experience while ensuring that their valuable content remains secure. In addition, Tata Sky recently selected Irdeto to enhance its end-to-end solution for OTT services. Irdeto's OTT solutions simplify the operations and workflow of supporting multiple digital rights management (DRM) systems. Irdeto Cloaked CA, the mostly widely deployed software CA in payTV across the globe , and Irdeto Middleware will provide Tata Sky with the flexibility to easily evolve their service and business models to meet changing demands. As Tata Sky's trusted security partner, Irdeto manages the planning and deployment of the project for Tata Sky to ensure the seamless integration of both Irdeto security technology and third-party solutions. Harit Nagpal, MD & CEO, Tata Sky said that too provide consumers with greater choice and convenience, the company needed a security partner that offers the freedom to innovate without fear. At Irdeto, the company is working with a strong security partner with a forward-looking approach and future-proof solutions. This enables us to continue innovating solutions and services while offeringthe peace of mind that our content is secure. Doug Lowther, CEO, Irdeto, noted that this deal further reinforces Irdeto's commitment to the dynamic and fast-growing media market in India.